BOOK Party & Event Entertainment. BOOK Grace Divine to entertain at your event. Grace Divine's performance includes shamanic music, dancing, and group psychic readings of audience members. She is the first in the world to combine She combines stand-up comedy and psychic mediumship to provide just the right amount of fun and paranormal. It doesn't matter how many people are in the group. Check out the video below when Grace was interviewed for paranormal zone TV. Grace is also available to do private psychic readings one on one in person, by phone or email. Go to our contact page and contact us for more information to group Grace Divine for your event. Please note, Grace Divine is an entertainer who aimes to provide fun and entertaining messages from the spirit world. Grace can also provide fun and impromptu paranormal readings of locations. If you are interested in booking Grace Divine contact us. DISCLAIMER: Grace Divine performances are 100% entertainment 100% of the time for fun and entertainment purposes only based on 100% opinion only. 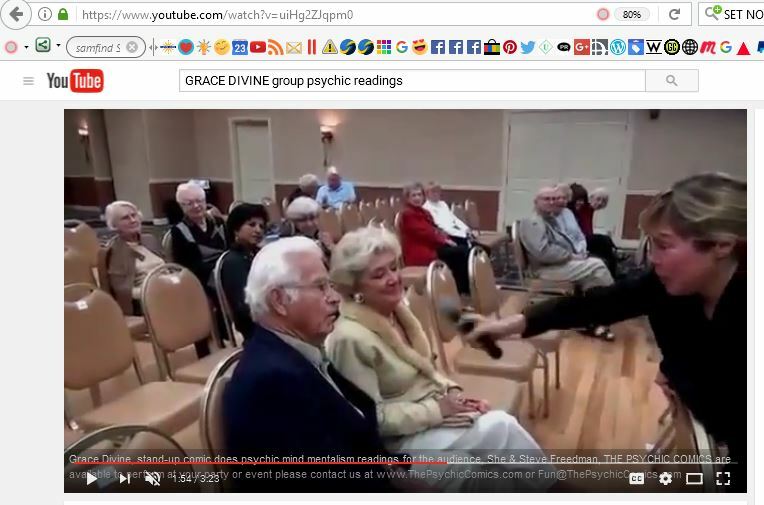 In addition, Grace Divine never engages in psychic house cleanings or exorcisms of any kind. Thank you.